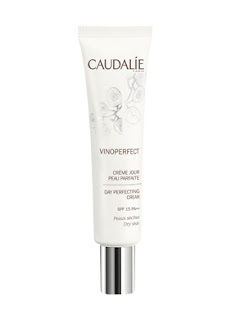 Caudalie has been getting quite a lot of hype recently on the beauty blogosphere. Yet, it's nothing new where I live, we've had these products around for years and to be perfectly honest, I did have some issues with the ones I tried many many years ago - issues that I attribute to the heavy frangrance contained in those products. However I felt like giving this product a try, because while I was researching what I could use instead of my beloved This Works Perfect Skin Miracle (which is tinted and too dark for me now), it came up as something with similar effect and properties. A correcting, perfecting, and nourishing face cream. This luxurious face cream is rich in patented vine sap viniferine and has a remarkable effect on existing blemishes—pregnancy stretch marks, scars, age spots, marks due to sun damage, and hormone imbalances. It contains a concentrate of active ingredients to treat and correct and revives the radiance of the complexion in an instant. Day after day, the skin seems transformed: imperfections and dark spots are diminished, the skin texture is refined, and the complexion becomes more even. The texture of the fluid melts onto the skin for a naturally perfect and luminous result, leaving skin remarkably radiant. In a few reviews I was able to found, this was described as a product that would make you look like you were wearing foundation, so my expectations were relatively high. This comes out of the tube as a peach colored fluid, that isn't oily at all and is absorbed really quickly by the skin. In fact, you have to use a good amount for it to spread easily. I should say too that there is a very light smell but it disappears quickly, so it shouldn't bother anybody. The skin is left radiant and I would say mattified as well, but other than that, there is no way I could get along with wearing this only. It's definitely not a replacement for a foundation or tinted moisturizer, not even the way Perfect Skin Miracle was. I would say that this is a good primer for makeup, and I did find that the foundations I used on top did last a little bit better, and my T-zone would be shine-free a little bit longer. However I have not been able to use this for more than a few weeks because I don't find it moisturizes my skin at all. Now that we're in Autumn, I do need a bit of moisture, and my skin was starting to feel tight from using this daily. I also have no idea if it does work against dark spots, uneven texture etc as I haven't used it long enough, but my guess would be that those issues would be tackled better with more active ingredients like glycolic acid or retinol. Probably a nice product if you're combination or oily and are looking for a day cream that doubles at a primer - but not moisturizing enough if you're normal to dry. The price isn't cheap either, particularly in the US, and I don't know if I would recommend spending USD 72 on this - unless you're a die hard fan of the brand. Active Ingredients: Octocrylene 10%, Ethylhexyl Methoxycinnamate (Octinoxate) 7.5%, Butyl Methoxydibenzoylmethane (Avobenzone) 3%, Ethylhexyl Salicylate (Octisalate) 2%. Inactive Ingredients: Aqua (Water), Octocrylene, Ethylhexyl Methoxycinnamate (Octinoxate), Butylene Glycol, Cetearyl Alcohol*, Butyl Methoxydibenzoylmethane (Avobenzone), Ethylhexyl Salicylate (Octisalate), Squalane*, Butyrospermum Parkii (Shea Butter) Fruit*, Potassium Cetyl Phosphate, PEG-20 Stearate*, Hydrogenated Vegetable Oil*, Tocopheryl Acetate*, Bisabolol*, Panthenol, Parfum (Fragrance), Dimethicone, Sodium Dehydroacetate, Palmitoyl Grapevine Shoot Extract*, Caprylyl Glycol, Xanthan Gum, Sodium Acrylates Copolymer, Hydrogenated Polyisobutene, Tocopherol*, Pisum Sativum (Pea) Extract*, Cyclodextrin*, Citric Acid*, Phospholipids*, Helianthus Annuus (Sunflower) Seed Oil*, Polyglyceryl-10 Stearate*, BHT, Sodium Hyaluronate, Geraniol, Limonene, Linalool. I've wanted to try Caudalie for a while, even though they're much too expensive. I'll be giving this one a pass and maybe try something else. Thanks!